White Oak has been doing top rated tree service in Richmond, Va since 1995. We provide the following residential and commercial tree services in Richmond, VA and the surrounding areas (Chesterfield, Midlothian, West End and more; see full list of service areas at the bottom of this page). Diagnostic evaluations, solutions and more. With over 20 years of experience and countless happy customers, we are the number one choice in Richmond and the surrounding areas to deal with whatever tree issue you may be facing. Whether you need emergency tree service, stump grinding, land clearing, limb removal, or tree pruning, we have the machinery, experience, and care to get the job done right. In addition, we can also apply professional grading services to create a smooth surface after trees are removed. As the owner of White Oak, I personally monitor every job from start to finish. I will be the one coming out to provide you with an estimate, overseeing the job, and making sure it is completed to your complete satisfaction. No matter what kind of tree service we perform for you, your residential or commercial property will be left in excellent condition as we’ve been doing for over 20 years! 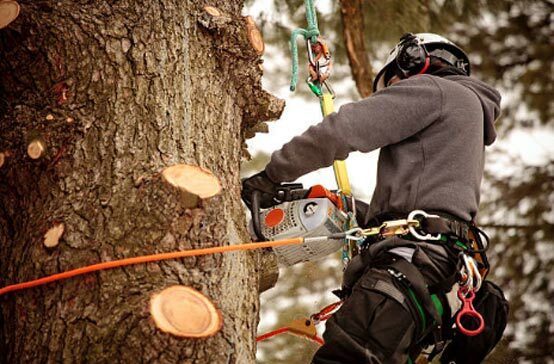 If, after meeting and receiving your estimate, you decide to hire us to complete your tree service, we’ll find a time that works for you to come out and perform the work. You may choose to be on hand or not while we do the job. Either way, we are committed to excellence in every project we do and will make sure that you are satisfied with the work we perform. If you have any questions about tree removal, tree trimming, stump grinding, or grading, don’t hesitate to contact us. I have used White Oak Landscaping & Grading, LLC, on two separate occasions. In Dec. 2012, White Oak removed four very large, tall trees, including a huge oak tree that was very right next to my deck and very close to my house. In April 2016, White Oak removed one huge tree. Both times, the service was excellent: reasonable price, prompt and quality work, great job cleaning up afterwards, friendly and honest staff, and appropriate credentials (provided me with a copy of their Certificate of Liability Insurance per my request). I will always use White Oak for any future tree removals and highly recommend this company for all types of tree- and stump-removal services. We’re proud to have received Angie’s List Super Service award for 7 years running and currently have 138 A rated reviews on tree service alone.